As we go through life, we are literally bombarded (both inside and out) by tiny packets of unstable energy (molecules) called free radicals. These free radicals come from many places. 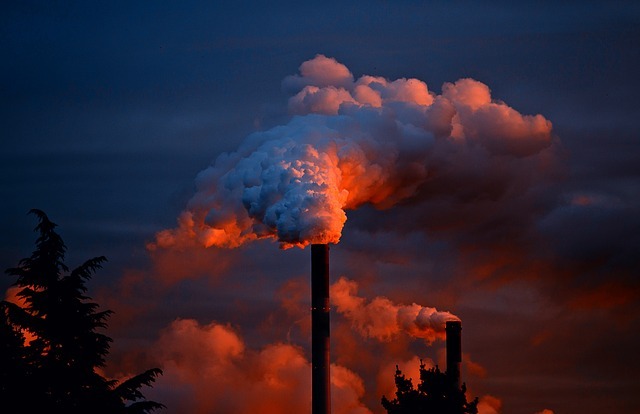 The environment around us supplies a steady dose of free radicals from such things as ultraviolet (UV) light, radiation, cigarette smoke and pollution. However, many free radicals also come from within us, due to inflammation and even day-to-day metabolism. 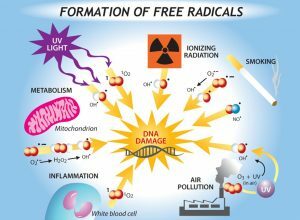 If left unchecked, free radicals can attack all the essential building blocks within the body, including DNA, proteins and lipids, with potentially disastrous effects. Free radical-induced DNA damage can produce chemical mutations that affect how a cell replicates, leading to either cell death or possibly cancer. Protein oxidation by free radicals damages important messengers inside and outside the cell that can compromise their function. And oxidative damage to lipids in the cell membrane (called lipid peroxidation) can change the structure of membranes and thus interfere with cellular communication. All these things are bad and can lead to any number of diseases, including Alzheimer’s disease, dementia, atherosclerosis, cancer, heart disease, inflammation and pain, joint disease, stroke, cataracts, vision loss, chronic fatigue…the list goes on and on and on. Free radicals work via a process called “oxidation” to cause “oxidative damage”. Basically, they steal an electron from other molecules, which turns those molecules into a free radical, and start a chain-reaction that can cause a lot of damage very quickly. Anti-oxidants can stop free radical damage. They do this because all antioxidants can donate an electron to a free radical without becoming a free radical themselves. This can stop the chain reaction and over time, can dramatically reduce a person’s risk of disease. There isn’t a tissue, organ or system in the body that doesn’t benefit from antioxidant support. There are many antioxidants to choose from; which one you choose can depend on what free-radicals you are trying to minimize and/or what organ or system you’re trying to support. Our next post will provide some guidelines you can use to customize your own antioxidant protection plan. Diplock AT. Antioxidant nutrients and disease prevention: an overview. Am J Clin Nutr 1991:53;189S-93S. Harman D. Free radical involvement in aging: pathophysiology and clinical implications. Drugs Aging 1993;3:60-80.